After the loss of our 18 year old Labrador, our family took a year before thinking about adding another little creature. Our pug Basil had grown up with his sister dog since she was 10 and we knew he would have some adjusting of his own as well. When we felt the time was right again, we decided we really wanted another pug and companion for Basil. We were just crazy about Basil and his breed, but did not want to buy from a breeder when there were so many dogs that already needed a family. Eleven years ago he was an impulse buy at a pet store for $350 and he came with a sack of dog food! Although we think that story is pretty funny the reality now is that these beloved dogs come from a place that’s not so great. We were so lucky to find Compassionate Pug Rescue! Marcia worked so hard to find us a special little girl for our family. After locating and rescuing her Marcia took her for medical care. She was being used to breed puppies and had just had a litter. She was infested with fleas. At the pet hospital when we picked her up she was underweight and frightened. Her ribs and hipbones poked out from her coat. We were so excited to meet and hold her, we just couldn’t wait to get her home. She was just beautiful to us and we named her Piper. There were so many things she had missed out on in her short little year and a half life. She was afraid of people, pets, walking on a leash, riding in a car, and did not know what a treat was. She had never known the comfort of sleeping in bed with a family who loves her. Since December Piper has came a long way. She learned to go potty outside right away. She has put on 4 pounds and there’s not a rib in sight. She knows just where the cheese is kept and can be found poking her head into the fridge, just the way Basil taught her. She’s super at walking on a leash and loves to play with Isabella our 2 year old daughter. She and Basil are inseparable companions. They snuggle and play, chase the lizards in the yard and watch TV together. She has brought so much happiness and joy to our lives and we know to Basil as well. 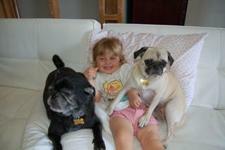 We tell Piper all the time that Compassionate Pug Rescue is her Fairy Godmother! Thanks CPR for rescuing Piper and for all the great work you do for these special dogs!